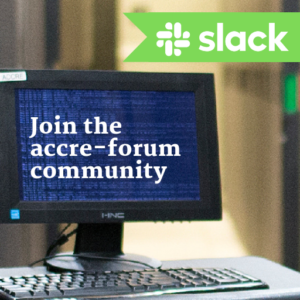 How do I change my ACCRE account password? I’ve forgotten my password or my password has expired; what is the procedure to reset it? Notify us by submitting a Request Tracker ticket. The script we run to reset your password propagates the change out to the cluster and sends you e-mail with your new password. This normally takes a few minutes, and we ask you wait at least 15 minutes to log on. As soon as you receive the e-mail with your new password, please follow the procedure to reset it to something of your choosing. Does ACCRE have a Hadoop cluster that includes tools like HDFS, MapReduce, Spark, Hue, Hive, Impala, and so on? Yes! Open a help desk ticket requesting (free) access. You can find more information about the environment in this blog post and in our Vanderbilt Big Data GitHub Organization. We currently have a development environment set up for Vanderbilt and VUMC researchers to access, and plan to build out a production environment over the next 2-3 years. I cannot connect to the cluster, am experiencing intermittent connectivity to the cluster, or the system hangs upon log on. What should I do? You may connect to the cluster only via a Secure Shell (SSH) client. For more information go to Logging on to the Cluster. If you see the following error when trying to connect: ssh: connect to host login.accre.vanderbilt.edu port 22: Operation timed out it means the gateway you’re trying to connect to is unreachable.The cluster has roughly 6 x86 gateway machines (See node configuration ). There are several reasons why we have multiple gateways of each architecture. For example, this distributes the user load across many login gateways. Another main reason is to protect against an unreachable gateway preventing a connection to the cluster.However, even with this backup system in place it is still possible when you ssh to login.accre.vanderbilt.edu to get an error similar to the above. login is only an alias which uses DNS round-robining to select one of the actual gateway machines to connect to. If you get the above error, what has likely happened is that either the local DNS cache on your system or the DNS server you use has cached an alias to a gateway which is now unreachable for some reason. If this occurs, you should simply select one of the actual gateways at random and attempt to ssh directly to it. For example, ssh vmps13.accre.vanderbilt.edu. If you can connect but the connection “hangs” before you receive a command-line prompt, your problem may be related to an error in one of your login files (e. g., .bashrc in your home directory). This we can help diagnose. Please send us a message via Request Tracker. If you can connect but your login “hangs”, it is possible we are experiencing a problem with GPFS (the General Parallel File System designed by IBM). Other symptoms of this include logging on but not being able to see, for example, your home directory. Sometimes the file system problem is temporary, lasting only a moment. Larger file system problems normally occur when the system is overloaded, which can happen for various reasons. If the problem is found to be caused by a particular user account or set of jobs, we immediately work with the user to resolve it.Sometimes the issue is not related to user software or the way a user is submitting jobs and we have to work with IBM to determine the root of the file system problem. When we expect the issue cannot be resolved quickly we notify all users to expect intermittent cluster access.In most cases when the system is in this state you should still be able to accomplish your work, albeit you may find the system is occasionally sluggish and intermittently nonresponsive. Please be patient. You will find upon repeated attempts you will be able to log on and submit jobs. If these jobs are not heavily dependent on disk I/O they should continue running. In any case, so we can immediately begin resolving the issue, please notify us ASAP of any connectivity problems by submitting a Request Tracker ticket. Include details such as a “cut and paste” of the information in your login window if you are able. login.accre.vanderbilt.edu is a DNS round robin alias for one of our ~6 cluster gateways. It is possible that the gateway you were randomly assigned is experiencing a hardware issue. When this happens we take the gateway out of the rotation but DNS may cache the old information for a period of time. Please open a help desk ticket for assistance. How can I make a scheduled downtime work for me? As a scheduled downtime for the cluster approaches more time becomes available for shorter jobs. Thus, if you have applications that take a few days or less to run, you will be able to execute more of these types of jobs as a scheduled downtime approaches because applications requiring longer period of times will not be running. It’s an excellent time to take advantage of the extra computing cycles that would ordinarily not be available! How do I mount a Samba (smb) share? where sharename is the name of the Samba share you were assigned. Next click Connect and you will be prompted for a Name and Password. This will be your cluster username and your Samba password. At this point hit Connect again and your share will be mounted as a drive in Finder. where *username* is your cluster username. For the password use your Samba password and hit enter or click ok. At this point your share will be mounted as a drive in File Explorer. Once you log onto the cluster (login.accre.vanderbilt.edu) , type: rsh auth. You are now on the authentication server. Type: chsh. You will be prompted for password. Enter the new shell you want to use. For bash, this is /bin/bash, for tcsh, /bin/tcsh. Type exit to log out of auth and then wait 20 minutes or so for the new setting be propagated throughout the cluster. Log onto the cluster again and you should see the change. How do I display graphics from the cluster to my local machine? Configure SSH tunneling: You must tell SSH on your local machine to allow the display of graphics from software running on the cluster. Windows users: Xming X Server is one of the best X Window servers available for Windows. You can follow the instruction provided there to install and set up the server. Mac OS X users: You can get a free X11 server from Apple. Mac OS X should already have SSH installed. Follow their directions to install and run the X11 server. When you log on to the cluster from the command line in the xterm, to activate SSH tunneling you can use the -X option, i.e., ssh -X user@login.accre.vanderbilt.edu. Finally, see below for how to quickly check you can display remote graphics locally. Linux users: We assume you are already running an X server and have SSH installed. When you log on to the cluster, ssh -X will activate SSH tunneling, i.e., ssh -X user@login.accre.vanderbilt.edu. See below for how to quickly check you can display remote graphics locally. I am running an X server, how do I fix X connection or .Xauthority file errors? try removing the .Xauthority file in your home directory, then log out and back in. This file occasionally becomes corrupted. When you log back in and start X, it will recreate your .Xauthority file. Sometimes you have to do this a few times. If you continue to have problems, please submit a Request Tracker ticket. What command do I need to type in order to run an executable in Linux? How do I change the group associated with a file? -R: recurse through subdirectories -f: suppress most error messages If you want to submit a job from group other than your primary group, please see this FAQ. What types of nodes are available? We currently have nodes with between 8-16 CPU cores and 24-256GB RAM. We also have a group of nodes equipped with modern NVIDIA GPUs and a small set of nodes with Intel Xeon Phi accelerators on board. Please refer to our Intro to the Cluster slides for more details. How do I run test jobs? We allow users to run very short (< 30 minutes) tests that have low memory usage (< 1 GB). Anything more should be submitted the scheduler. We have a debug SLURM partition/queue available for running quick tests and prototyping. What are the ACCRE cluster defined attributes I can use in my SBATCH scripts corresponding to the available node properties? The properties of our compute nodes can be specified with combinations of available attributes (defined by us), e.g. : haswell, sandy_bridge Note that the haswell attribute requests the latest Intel processors, while sandy_bridge requests the previous generation. In your batch script you could specify: #SBATCH --constraint=haswell. This would instruct the scheduler to run the job only on a node with an Intel Xeon Haswell processor. Note that your job may take longer to start when these attributes are included as you are limiting the pool of resources the scheduler can choose from. For a full list of available features, trying running the sinfofeatures command while logged into the cluster. Can I run on the gateway machines? When you log on via login.accre.vanderbilt.edu, you are logged onto a gateway machine. From here you submit your jobs which are sent to the compute nodes by the scheduler. However, we do allow you to run very short, < 30 minute, test jobs on the gateway machines, as long as such jobs do not slow the gateway for other users. Anything longer than this should be submitted to the compute nodes using sbatch (see the tutorial). What happens if my job uses more resources than requested? The job scheduler will automatically kill most jobs which exceed the resources requested in the SBATCH script. For example, if you specify a walltime of 4 hours and your job runs over that, the scheduler will kill the job. The reason for this is that running jobs which use more resources than requested may affect the scheduling and running of other jobs. This is because the scheduler relies on SLURM specifications (among other parameters) to determine on which nodes to run jobs. Also read our job scheduler policies for more information on killing jobs which are interfering with other jobs or the system itself. When testing code or running code you are unfamiliar with, you should more diligently monitor the resource consumption to fine tune your SBATCH request. Specifying much more, e.g., walltime or mem, than your job requires may delay its start time if the requested resources are not immediately available. Therefore, you should start somewhat conservatively, then reduce your resource specifications once you’ve determined what you are really using, still always leaving a buffer to ensure the job is covered. Learn more about how to request resources and the SBATCH defaults when you submit a job. Learn how to monitor and check the status of a submitted job. Why is my eligible job waiting so long in the PENDING state? There are several things you should check to understand your wait time in the queue. See tips on checking the status of a submitted job. Check your group’s current usage by typing qSummary -g group_name. Compare that to your group’s bursting limits by running showLimits -g group_name. If your group’s current usage is close to or equal to its bursting limits, this could be causing delays. Details about both of these commands can be found by clicking on this link. Check overall cluster utilization with the SlurmActive command. Check the queue and current usage on the cluster. It could be the particular resources your jobs need may be heavily utilized, even if the entire cluster is not. You can check the total usage of the cluster with the command squeue. You can also see current and past utilization levels on this website. Your account or group account may be running over its fairshare. This means when the cluster is very busy, other jobs from accounts which are under fairshare may be assigned higher priority and may jump ahead of your job in the eligible queue. Use the showLimits -g group_name command to check your fairshare. If you still do not understand why your jobs are not starting more quickly, please submit an RT ticket. What does job status Deferred mean? In SLURM there is no “deferred” state. However, jobs may ask for resources that cannot be provided, e.g., too much memory. In such cases, running the command squeue and looking for your jobib, slurm will provide a short explanation of why the job either cannot run, or is not running. Do squeue -u <username> to see the explanation. What is the maximum number of jobs I can submit or have running at any one time? “Active” Limits: Each user/group/account has a limit on the number of processors in use at any time. This number is summed from any combination of single and multi-processor jobs. Additional limits are placed as necessary for groups running either medium (defined as 4 to 7 days) or long (over 7 days) jobs on a regular basis if there usage is impacting the ability of other groups to use their full fairshare. Individual groups may also request upper limits on their users. New guest users have upper job limits until they have attended the Introduction to the Cluster and Job Scheduler classes. Use the showLimits command to check your group’s limits. Please refer to the job scheduler policies for additional important details of these limits. What is the maximum allowed “wall clock time” I may specify? The maximum allowed walltime is 14 days, or in hh:mm:ss = 336:00:00. Your job will not start if you have specified a walltime greater than this. You may reduce the walltime of an already submitted job using scontrol (slurm job control). In addition we ask that, except for a small number of test jobs, jobs run at least 30 minutes and over an hour in length is preferable. Our job scheduler policies explains more on this subject. Also see How to Submit Basic Jobs for other SBATCH specifications and how to deal with very short jobs. How do I hold/release/delete a job? A user may place a USER hold upon any job the user owns. To do that, type: scontrol hold <jobId>. To release the held job, type: scontrol release <jobId>. Note that you can only hold and release jobs that are pending (i.e. this will not work for running jobs). User can also delete a queued/running job using the command: scontrol resume <jobId>. To delete all the jobs owned by the user, type: scancel -u <userid>. To cancel a job by name, type: scancel --name <jobName>. Where can I find detailed documentation on all SLURM commands? How can I delete many jobs at once? How much memory is available on each node? Because the OS and other system processes (e.g. GPFS managment) already use certain amount of memory, not all physical memory is avaiable for running jobs. In general, ACCRE nodes contain anywhere from 22GB – 248GB of available memory for jobs to use. How do I request all the processor cores in a node? Since the cluster has some nodes with 8 cores (2 x quad-core processors) and some with 12 cores (2 x hex-core processors) there is no way to generically request all the cores in a node. You can control whether your job lands on a 8-core or 12-core node; however, there is no SBATCH directive which effectively says, “Give me all the cores in the node no matter how many there are.” If your SBATCH script has SBATCH -n 8 asking for 8 cores, your job could land on either an 8 or 12 core node; including the attribute eight will ensure your job is run on a 8-core node (see the next FAQ). If your SBATCH script has SBATCH -n 12 your job will only land on a 12 core node. However, this might increase your wait time in the queue as there are currently more 8-core nodes than 12-core nodes in the cluster. How do I request a node for exclusive usage? Note that in this case, the job can be assigned to an 8-core, 12-core, or 16-core node that is shared with other jobs. Note that requesting exclusive access to a compute node may result in longer queue times. Do ACCRE compute nodes support hyperthreading? All ACCRE CPUs are Intel-based, and therefore support hyperthreading. If you request 2 tasks/cores in your SLURM job, SLURM will allocate 2 physical cores (or 4 logical cores) to your job. However, the user must decide whether to make use of hyperthreading or not, and instruct his/her program to do so. We leave hyperthreading enabled on all but our GPU nodes. Many multi-processor applications can take advantage of hyperthreading to run in significantly less time. Please see http://www.intel.com/content/www/us/en/architecture-and-technology/hyper-threading/hyper-threading-technology.html for more information on hyperthreading. If I belong to multiple groups, how can I define the group name under which my job is to run on the cluster? You can add the following line in your SBATCH script: #SBATCH --account=<mygroup>. Here, mygroup is the group name that you want the job to run under. To change group associated with a file, please see this FAQ. How do I checkpoint my job? If your job runs more than a few hours, it is a good idea to periodically save output to disk in case of failure. We current do not provide any checkpointing integration through SLURM, so any checkpointing must be performed directly from a user’s application. How do I use local storage on a node? We’ve added the tmp_cleaner() function above, otherwise the data will remain in /tmp if the job is cancelled. The function intercepts the SIGTERM signal and deletes the data before the job ends. The cleanup must complete before the 30 seconds of grace time that Slurm gives to jobs to complete before forcibly killing all the job’s processes. A SLURM command fails with a socket timeout message. What’s the problem? avoid frequently calling SLURM commands like squeue and scontrol for automated job submissions and monitoring. Job arrays reduce the load on the scheduler because SLURM only attempts to schedule the entire array once, rather than every element within the array independently. Short jobs produce more “churn” within the job scheduler as it works to allocate, de-allocate, and re-allocate resources at a rapid pace. If you are running a lot of short jobs, please try to bundle multiple jobs together into a single job to put less stress on the scheduler. Similarly, automated monitoring tools can abuse the scheduler by requesting data from SLURM too frequently. Please reach out to us if you need assistance developing alternate methods of monitoring and submitting jobs in an automated manner. The socket timeout error message is generally intermittent, so if you wait a few minutes and try your SLURM command again it may complete immediately. The left section shows information about your current disk usage on /home and /scratch, while the right section shows your current file count usage. If the group purchases additional space on /data, /scratch, or /dors it’ll be listed. Note that the Usage column is your current disk usage, the Quota column is a soft limit, while the Limit column is a hard limit. Definitions for soft and hard limits can be found on our cluster disk policies page. If you are exceeding either your disk space or file count soft quota, the relevant line will be colored yellow, as shown in the example below. Make sure you delete (or compress) files as soon as possible in order to avoid disk I/O errors once the grace period has expired. If a line is colored red, it means you have either hit a hard quota limit, or your soft quota grace period has expired; any attempts to create additional files in the corresponding storage will result in I/O errors. Note that /home and /scratch are generally controlled with user or group quotas, while /data is controlled with fileset quotas. A user or group quota is based on the user or group owning a set of files, while fileset quotas are applied directly on files within a parent directory. One instance in which this distinction becomes important is when you are sharing files with a collaborator or labmate. With user-based quotas, if you copy a file into your colleague’s home directory, the file will still count against your quota if the file owner is not changed. You can check the owner of a file by using the ls -l command. One other important detail about quota is data replication. ACCRE currently has data replication set to two for /home. This means that the disk usage of a file stored in /home on the cluster will be approximately twice that of a file outside the cluster. The accre_storage command shows you disk usage without data replication, so the output of du -sh (which shows you disk space of a directory or set of directories, and includes data replication) will differ from the accre_storage command. ls -lh, on the other hand, will show you file sizes without considering data replication, so it will be consistent with the output from accre_storage. My group has storage on DORS. How can I check our usage? where vunetid is your unique VUNetID, which is also your ACCRE user id. If you are unsure what your VUNetID is, simply type whoami while logged into the cluster to find out. Note that the chmod 700 command is needed to set the appropriate permissions on your scratch directory so that only you can access it. 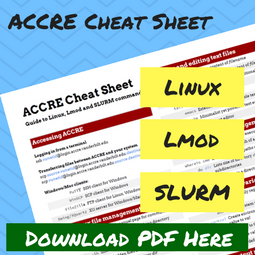 Note that some ACCRE groups also have their own private shared group /scratch directories. If I need more disk space than this, will you temporarily grant a quota increase? We do not necessarily relax quota restrictions. It depends entirely on the details of your request and we can discuss your options. Please submit a Request Tracker ticket explaining why you wish a quota change, how much space you believe you require, and how long you expect to need it. If you need more diskspace for an extended period of time you may purchase it. Please see the details of our cluster disk policies then send us your request. Will ACCRE restore deleted or lost data? Yes. Please refer to our policy regarding restoring from backup. My network connection to ACCRE is really poor and I have a lot of data that I need to upload to ACCRE (or download from ACCRE). What are my options? To transfer files between your local machine and ACCRE, it is recommended to install and use FileZilla. FileZilla is a simple to use client which allows you to use the SFTP protocol to upload and download files between systems. To install FileZilla, simply go to their website and download the client The following is a beginner’s guide to FileZilla: https://www.ostraining.com/blog/coding/filezilla-beginner/ If you do not want to overwrite files each time you upload a directory to the cluster then you can do the following: go to Edit > Settings > Transfers > File exists action and change the Uploads setting to Overwrite file if source is newer. Changing this setting will only upload files that are newer than the copy on the remote system. Linux and Mac clients could also just use the built-in rsync command. How do I request a gpu node? Currently, you must belong to a “GPU” group, such as nbody_gpu to gain access to one or more gpu nodes. Use the appropriate SBATCH command to submit your job and tell SLURM you want a GPU node. For example: #SBATCH --partition=maxwell This will place your job on a node with NVIDIA Maxwell Titan X GPU cards. More details about submitting GPU jobs can be found by clicking here. What research software packages are available on the cluster? Run module available to see a comprehensive list of available software packages that can be accessed from your environment by using the module load command. How do I make sure that my perl/python script is using the latest version available on the cluster? as the first line of your script. This automatically detects the path to the added perl/python package and use that version as the interpreter of your script. I’d like to have some software installed on the cluster. How do I go about doing that? 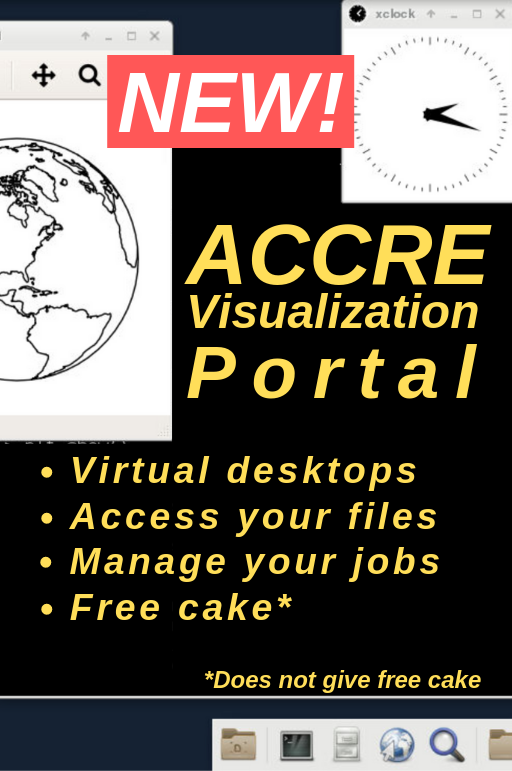 As much as possible, ACCRE staff are glad to accommodate your needs for software. Of course, the software must be amenable to execution in the cluster environment and (if not open source) you are responsible for taking care of licensing arrangements prior to installation, as well as continued maintenance of the software license. If you’d like to explore the possibility of adding some software to our cluster environment, please submit a Request Tracker ticket. Note that we in general recommend that users install software into their cluster home directories. In this way you have complete control over the version of the software, applying updates, and so on. ACCRE staff are more than happy to assist you during this process. How do I install an R package from source code? What happens if R says that there are needed dependencies? This sometimes happens, and you will need to download and install those packages before installing the one you wanted. Just follow the steps outlined above until you have downloaded and installed all the packages. How do I download and install an R package from the internet? R will now give you a list of repositories to download from. Choosing the Tennessee repository seems good. That is choice 80. R will now download, compile and install Zelig into your personal R library, ~/R/rlib. This passes an additional argument to the configure script that determines the locations and versions of libraries used to build the hdf5r package. You should see Zelig loaded. You need to remember to add these two lines to any script you feed to R if you intend to use Zelig. If you wind up installing many packages you can put the .libPaths("~/R/rlib") command in your .Rprofile. How do I install and load an R package from Bioconductor? You should see goseq and the two dependencies loaded. You need to remember to add these two lines to any script you feed to R if you intend to use goseq. If you wind up installing many packages from Bioconductor you can put the .libPaths("~/R/rlib") command in your .Rprofile. How do I install a perl module without root privilege? How do I check which python packages are installed? would list all installed packages and modules in three columns of output. By default, installed packages are output in two columns. How do I install a python module without root privilege? We encourage users to create virtual environments, either through virtualenv or anaconda, to avoid dependency conflicts between packages. 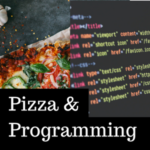 For more information, see our python software pages. How do I install a python package from source code? This installs the package to /home/YOUR.VUNETID/.local. All packages installed to that directory are automatically added into the python environment. How do I run Matlab/SAS job on the cluster? As of May 2018, Matlab is free to use for all ACCRE users. More information is available here. In order to run SAS jobs, you must first purchase a license from ITS software store. Once ITS notifies us your purchase, you will be added to the relevant group so that you can have permission to run the software. License may not be shared among different users. However, with one license, you can run multiple jobs at the same time on the cluster. When trying to install a package in R, I get ‘Warning: unable to access index for repository <https://some.repository.name>’. When trying to install a package in R, I get ‘Warning message: package ‘somepackage’ is not available (for R version 3.0.0)’. Try using the latest version of R.